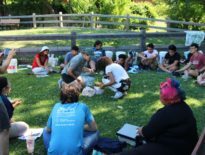 In 2017, ILSR launched the Baltimore Compost Collective, a food scrap collection service that is employing local youth in Curtis Bay. Curtis Bay is a historically disenfranchised neighborhood in Baltimore and one of the most polluted zip codes in the country. A long industrial history has left it with a legacy of environmental contamination and associated avertable health impacts. This reality, coupled with high unemployment, high levels of family poverty and a general lack of basic infrastructure has created a situation where residents lack both economic opportunity and access to fresh food. Yet, in spite of these steep challenges, the community is coming together to forge a more self-reliant path forward. The Baltimore Compost Collective collects food scraps primarily from residents of Federal Hill and Pure Raw Juice, the local juice bar. Other serviced areas include Curtis Bay, Riverside Park, and Locust Point. Once collected, the youth employees compost these food scraps at Filbert Street Garden using a rat-resistant 3-bin composting system. 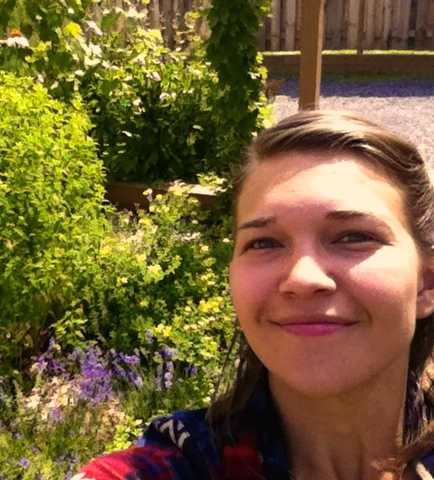 But, the Compost Collective is more than just an employment opportunity. It is an entrepreneurship program where youth are trained in workforce skills, food access programming, and community-scale composting. They are receiving guided, hands-on experience managing a small-scale composting operation and its expansion. The compost they create is used to grow fresh produce for the community at Filbert Street Garden. 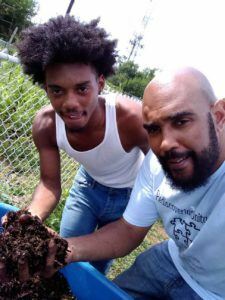 Marvin Hayes, a longtime youth life-skills mentor from Baltimore’s Sandtown-Winchester neighborhood is the Compost Collective’s program manager. With more than 20 years of youth mentorship experience, ranging from leading wilderness experiential learning expeditions to coaching football and basketball in inner-city Baltimore, Marvin is uniquely qualified to prepare urban youth for joining the workforce. Once employed, youth are coached through required paperwork, opening bank accounts, customer service, route management, composting science, and more. For most, this is their first job. 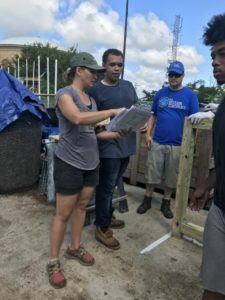 To date, the project has employed five high school students or recent graduates from Curtis Bay’s Benjamin Franklin High School; two have moved on to other employment. The project’s current youth employees are Rayjion Hall and Anthony Walton. 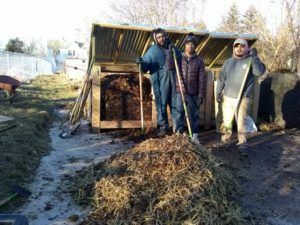 The Compost Collective is a collaboration among ILSR’s Composting for Community project, United Workers, and Filbert Street Community Garden. ILSR provides administrative and technical support to the project, including compost training. United Workers is the nonprofit host of the Compost Collaborative, while Filbert Street Garden provides a home for the actual composting and compost utilization. 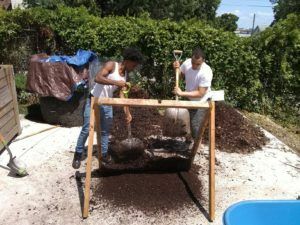 Initially launched under a grant from the Abell Foundation, the goal is to make the Compost Collective a financially self-sustaining enterprise. 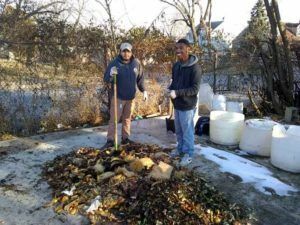 To achieve this, the Compost Collective is working to expand its residential customer base in the Curtis Bay, Federal Hill, Riverside Park, and Locust Point neighborhoods. 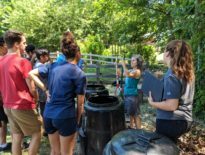 In order to accommodate more food scraps and further its impact, the Compost Collective needed to expand its composting capacity. 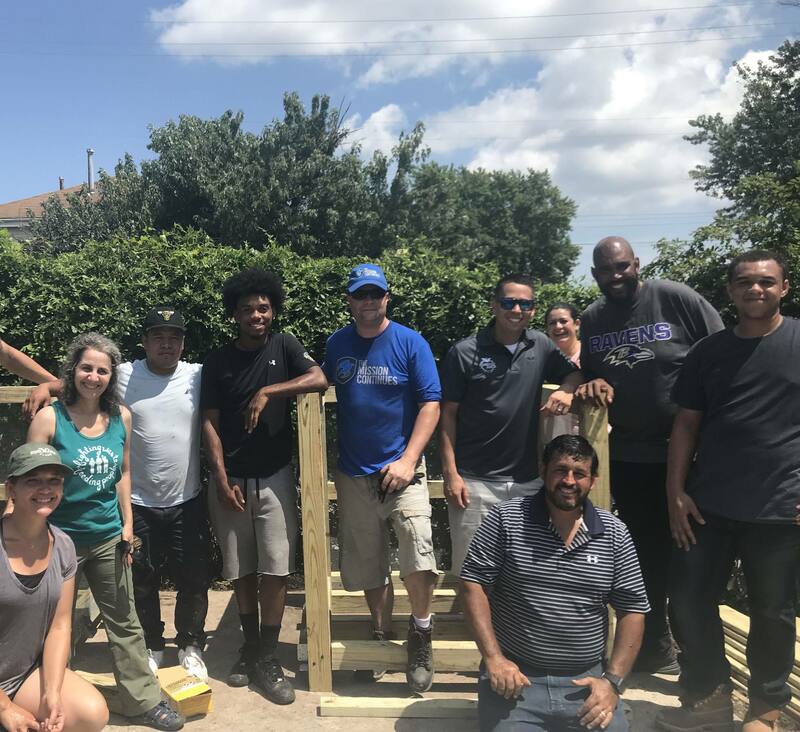 On Saturday, August 4th, employees of the Compost Collective and ILSR were joined by several partners to construct a second 3-bin system. 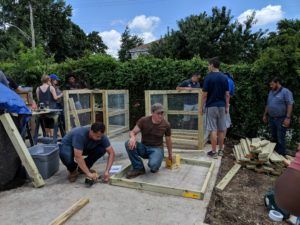 Partners include Filbert Street Garden, United Workers, Eagles Construction LLC, Pure Raw Juice, Chesapeake Arts Center MakerSpace, A Few Cool Hardware Stores/Federal Hill ACE Hardware, and The Mission Continues – Baltimore 2nd Service Platoon. The success of the day would not have been possible without these partners providing support, volunteering their time, or donating funds, materials, or tools. As Marvin likes to say, teamwork makes the dream work! ILSR’s Linda Bilsens Brolis organized the bin build. ILSR extends particular thanks to all the Collective’s paying customers who set out their food scraps every week (you know who you are! 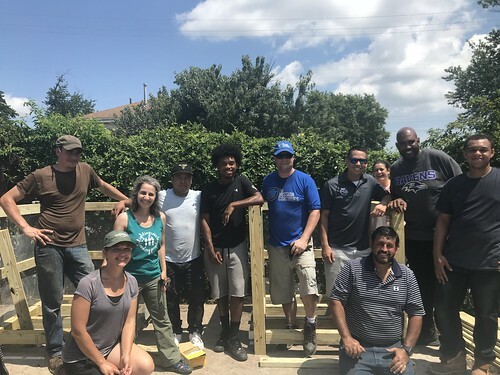 ); United Workers for hosting the Compost Collective; Henry Scott at Makerspace Chesapeake Arts Center for sharing his building skills and tools; Clodoaldo Santos at Eagles Construction for volunteering a full day to act as lead builder (and bringing his family, grill and tools! ); Rodette Jones and her crew at the Filbert Street Garden for hosting the composting systems and so much more; Richard Manson at Pure Raw Juice for raising $1,500 to make the bin build possible; Gina Schaefer of A Few Cool Hardware Stores for donating supplies; Michael Dorsey of Dorsey Consulting LLC for his vision and support; Christophe Paul at The Mission Continues – Baltimore for rolling up his sleeves; Heather DeMocker for filming the event; and the Compost Collective’s two youth workers, Rayjion and Anthony, and their absolutely amazing leader Marvin! BCC’s Rayjion and Marvin with some hard-earned black gold (aka compost). Special shout-out to BK ROT in the Bushwick neighborhood of Brooklyn, N.Y. for inspiring us to adapt its model to Baltimore. And, last but not least, thanks to the Abell Foundation, the Robert C. Schumann Foundation, Virginia Cretella Mars Foundation, The 11th Hour Project, and Patagonia for funding our Composting for Community program or Baltimore-specific activities. This project would not be possible without your support! The Compost Collective is seeking partners interested in helping this unique enterprise continue to build bridges and opportunities in Curtis Bay. Interested in learning more, or know someone who might be interested in becoming a customer? Visit www.BaltimoreCompostCollective.org for more information.